A great weekend with my old and dear friend Debs with whom I worked on the campaign to stop Project Aqua, the diversion of most of the low flow of the Waitaki river. We won that one, and we will win this one too! One of the precious things about this roadshow is reconnecting with friends I’ve worked with – like Mike and Joe and Robina from Mataura in the days of the lignite scare, who drove through to Invercargill. Debs drove me over the hill to Blenheim (we talked Denniston all weekend) where I presented at the opening of the art exhibition “Oil on Canvas”, a fund raiser for the active campaign aginst deep sea oil drilling, organised by the amazing Verena Maeder. A ready made audience and companion speakers Rod Morris, whose photos have built love and awe for the Denniston Plateau nation-wide, and entrepreneur Nick Gerritsen, about his latest project to make liqiod fuels from wood waste. I foresee waste wood from forestry operations becoming the next scarce resource as people realise it is our lifeline to an economy without fossil fuels. 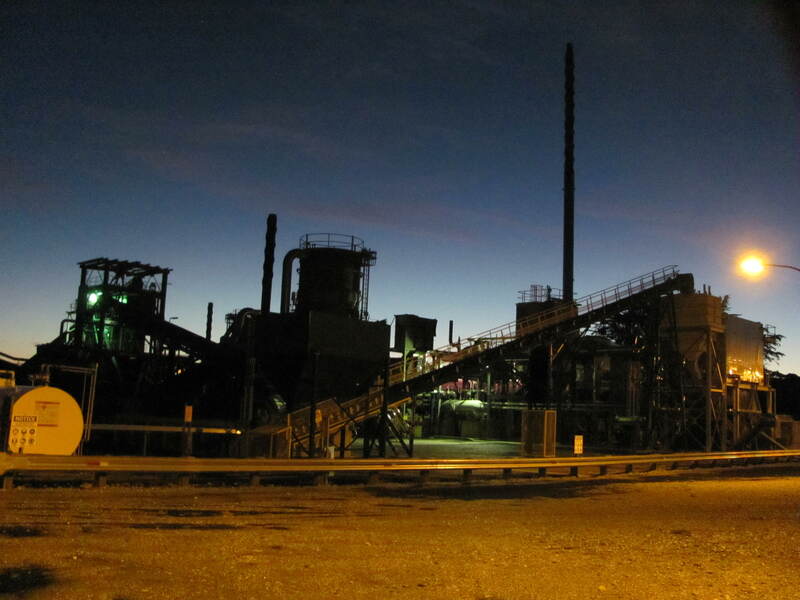 Boiler fuel, home heating, transport fuel, even coke for steel making, and of course the ultimate finite resource is land, on which it all depends. Even with renewables we can’t keep growing forever. Beautiful art works, all local, including one of Rod’s images of Denniston which I coveted, but wasn’t feeling rich. One that particularly took my eye was a disturbing painting called 2L8. I know in my head it probably is, but I refuse to believe it and the only way to live is to try to still make a difference. You learn something every time you stand up to talk to a group. I’ve been singing the praises of NZ innovation LVL, a strengthened timber building material that can substitute for steel and concrete in multi-storeyed buildings – very low carbon, in fact stores carbon for the life of the building. I’ve been lamenting that Christchurch was not rebuilt in this sustainable material, partly because there is no fabricating plant here to cut the stuff to order. A voice from the back row in Takaka called out “not true. Nelson Pine opened one this week”. Turned out to be Piers McLaren, doyen forester with whom I have corresponded but never before met. Led to a useful discussion with the CEO of Nelson Pine the next day. 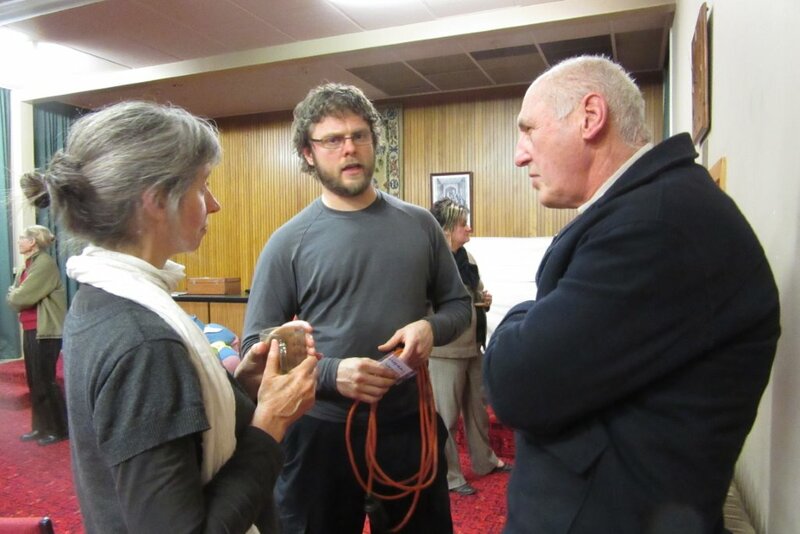 So Blenheim, Takaka, Motueka and Nelson – lots of great people all working in their own way on a fossil free future. 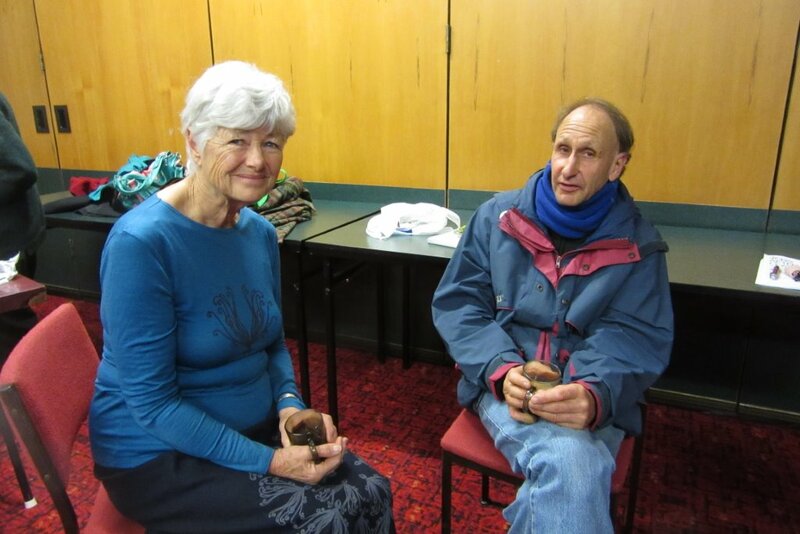 Then to Dunedin where I met up with Rosemary. We managed our “Two Ronnies” act OK at the university presentation. The Chamber of Commerce wanted a rather different slant – business opportunities in a low carbon economy. They booked quite a small room so it was a good experience for them to find it booked out a day ahead and they were squeezing people in on the night. More general public than business, but some of the latter too and I’ve heard it did make an impression on the Chamber. Back to Rosemary…. I teamed up with Jeanette again for the two Dunedin presentations on 29 and 30 July, to audiences of around 50 at each venue. The following afternoon, armed with cups of tea and sandwiches for non-stop travel, we headed to Invercargill where fellow CANA organising member Jenny Campbell had a precisely timed two days awaiting. A pot luck tea, catch-ups with fellow Southland anti-lignite campaigners and our JAC presentation followed – complete with our very own climate change sceptic in the front row. Neither Jeanette nor I needed to respond as the Invercargill audience deftly dealt with his comments. The following morning we met with Steve Canny and others at Venture Southland for an exchange that lasted the entire morning, with an interlude to pose for the Southland Times and a TV interview with the very patient and charming Cue TV reporter. Thanks to Dave Kennedy for organising the Venture Southland meeting – their work is inspiring. I spied their speedy little electric car being delivered as we left. A couple of spare hours were filled with unexpected discussions with bank staff when Jeanette’s plastic card was swallowed up by the ATM machine, never to be returned. They were so nice. (Jeanette: So they should have been – Bank’s mistake, not mine! ) You just can’t get angry with Southlanders! We kept hearing about the next event on Jenny’s itinerary: the Environment Southland Awards. It’s big, we were told. Southlanders are not known to exaggerate, even so, we were both surprised at the scale of the evening at the Ascot Hotel – live TV, over 500 guests for a full meal and accompaniments, anyone who’s anyone there and, as is always the case down this end of Aotearoa, they all seemed to know each other. The best part of the evening was the very last prize being awarded to Jenny’s group, Southland Forest and Bird, for their remarkable 25 years of restoration and care of the yellow eyed penguin reserve, Te Rere. A very early morning at Invercargill airport completed this leg of the JAC roadshow. We look forward to being invited to other parts of the country to continue the discussion. For me, it’s about more than phasing out coal mining. It is a good place to start the necessary work we must all now participate in – to build and manage a fair and durable shift to a low carbon economy, where workers do not bear the brunt of that shift. From here, our little JAC relay looks like part of an enormous marathon. Change is emerging but we’re racing to a deadline. A just transition to a low carbon economy has to be fair and it has to be swift. We need everyone’s diverse, creative skills to keep that baton moving, run like hell, and pass it on. We have advantages many other countries could only dream about, and we look forward to taking charge of our own futures instead of being at the mercy of unjust market forces and a dying industry. It’s already happening.